Welcome! Mark and Sue Edgington, along with our son Andre and our friendly staff, invite you to experience the Adventure Inn. 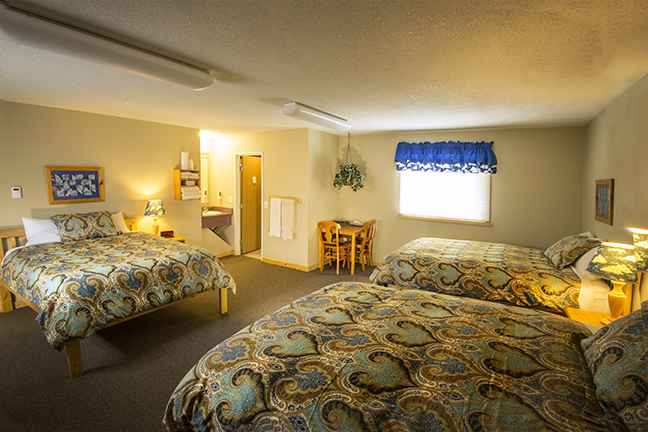 We strive to provide those special touches that make for a memorable stay in Ely, MN. 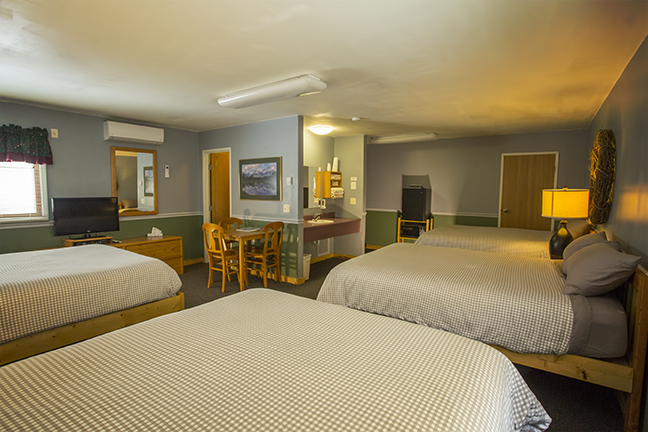 Whether preparing for a trip into the BWCAW, or just wanting to experience Ely, the Adventure Inn will offer you clean and comfy, eco-friendly lodging. Our staff will make sure your rooms are immaculate, the coffee locally sourced and steaming, and the pastries made right here in Ely. Down pillows and duvets will snuggle you at night, along with our organic cotton sheets. We offer dog friendly accommodations as well. Just ask about our dog friendly rooms. At the eco-friendly Adventure Inn, all accommodations are non-smoking, and come equipped with microwave, fridge, TV, A/C, free Wi-Fi, plus raw silk or down comforters and pillows. Some of our rooms have recliners, tub-showers, or jetted jaccuzzi tubs. Join us for delicious homemade pastries and fresh brewed locally roasted coffee in the lobby each morning. Many of our rooms are dog friendly, please ask! View the full listing of accommodation types. We offer Single King rooms with tub-showers and recliners and Single Queen rooms, not pet-friendly. Ask about our Jacuzzi King Rooms which are dog friendly! Two-Queen accommodations, 2 in the main building and 6 in back, sleeps 4, not pet friendly. We also offer 2-bedroom suites with full kitchen, pull-out futon couch in living area, sleeps 6, dog friendly. Ask about our 3-Queen Room, across from a 2-Queen and 4-Queen to accommodate large groups, dog friendly. Rm 23 upstairs is large with tub shower, across from Rm 22. Room for large family or group to spread out. Dog friendly. 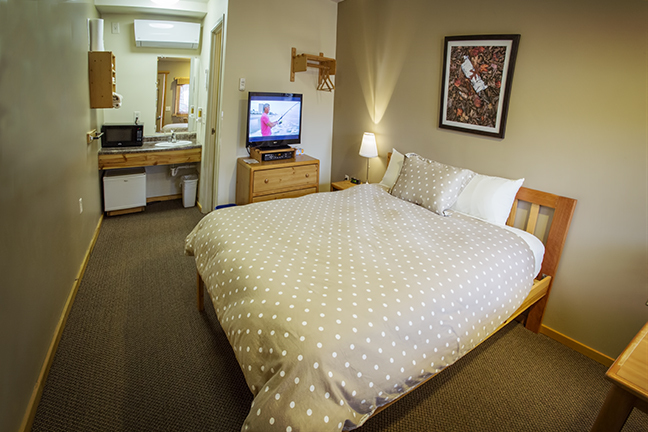 We also have two wheelchair accessible rooms. The Adventure Inn was perfect for my family! The staff was super helpful, and our two separate Queen rooms, plus the great kitchenette were clean and perfect! The Adventure Inn is adjacent Boundary Waters Canoe Area Wilderness, conveniently located in Downtown Ely near fine dining, pubs, health spas, outfitters and area attractions. Need a special getaway on the boundary waters? Are you looking for that remote, rustic cabin bordering the BWCA in Ely, Minnesota? The Leaning Cedar Tree Cabin is the perfect adventure getaway, also managed by the owners of the Adventure Inn. Unplug, relax and enjoy nature. All the comforts of a fully-stocked and beautifully decorated cabin without wireless or electricity to remind you of the "real world." Our remote log cabin is fully bordered by beautiful wilderness and water. Can't decide which room to book, when to visit, or what to do when you get here? We'd love to help you plan your vacation. Send us a message, or if you need immediate assistance please call, and we would be happy to help!